Quzzle is a toy puzzle made using injection molding. 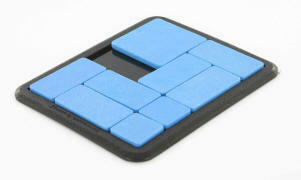 Quzzle’s inventor had the goal of creating the most difficult simple sliding block puzzle in the world. The Quzzle was computer designed. Every possible puzzle among ten’s of thousands was considered among puzzles with pieces one by one, one by two, and two by two in frames up to four by five; where the objective is to move the largest piece from one specific corner to another specific corner. It has been shown that sliding block puzzles are PSPACE-complete – a theoretical class of problems that are inherently difficult even for a computer to solve. In fact sliding block puzzles can themselves form an unusual type of computer. What does this mean? For example, one could devise a sliding block puzzle that "computes" whether a certain number is a prime number, by having a solution if the number is prime and not having a solution if the number is not prime. It is a rather bizarre diversion in the world of computer science.